Fill in the blank with any number of words, and the sentence rings true. Travel, cleaning, laundry, feeding raw food, and, if I’m being honest, the word LIFE has also been uttered a time or two. A glass-half-full perspective tells me that travel complexities and the volume of cleaning and laundry with big dogs aren’t obstacles after all. They are “opportunities” for me to demonstrate ingenuity, resourcefulness, determination, and, let’s face it, patience. Never more are these qualities put to the test than when I am feeding a raw diet to two Mastiffs on a budget. Raw Paws Pet Food sent me a bag of Endurance Blend Complete Beef Patties for Dogs in exchange for my honest review. In this post there are affiliate links from which I may receive a small compensation. There is NO ADDED COST to you should you use these links. Thank you very much for your support! 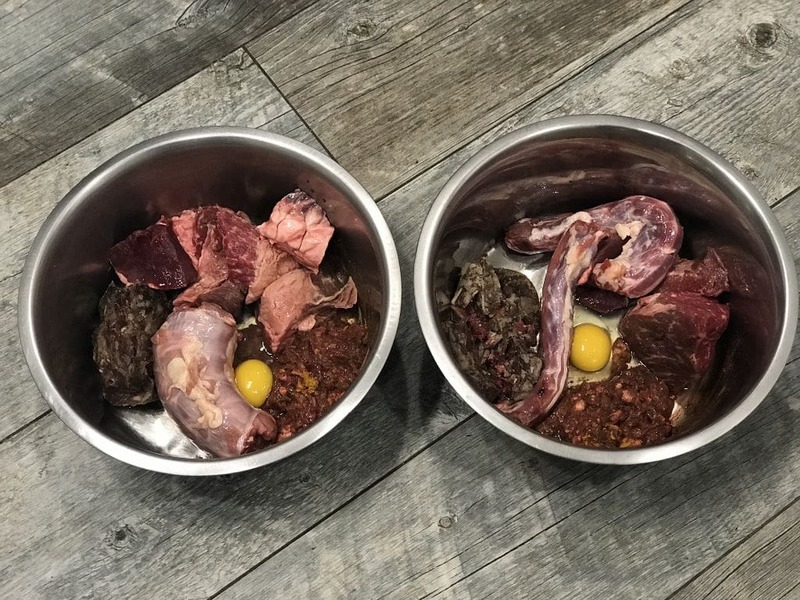 One of the common myths about feeding raw to big dogs is that it just can’t be done on a budget. I suppose there is a modicum of truth to that if you are buying your meat from your local grocery store. While many raw feeders can source food locally through a raw food co-op, online retailers like Raw Paws Pet Food are making feeding raw even easier and cost-effective for big dog owners. They do this by offering bulk deals on high quality raw food with free shipping. One of the quickest paths to the poor house while feeding raw to big dogs is by over feeding them. I speak truth through experience, unfortunately. My Sulley has, what some (veterinarians) might call, a weight problem. The combination of a post-neuter slower metabolism, him stealing food from Junior, and me feeding too much, poor Sulley has been left with a sausage belly the size of Porkopolis! What is a Big Dog Mom to do when her big dog is too big? The obvious answer to this rhetorical question is to feed less. The benefit of less food is two-fold: better health and a cost-savings while feeding raw. Proper weight for a big dog is one with no visible ribs or rolls. In contrast to a daily diet of dry kibble, feeding raw requires that you put your thinking cap on once in a while. Whether this is in sourcing your meat, or in balancing your dog’s meals, thinking outside the box will yield better health and cost savings. Raw Paws Pet Food recognizes the importance of providing quality raw food at an economical price and has numerous options for adding variety to the balance of your dog’s diet. I have had the pleasure of reviewing two of their products, Beef Esophagus Jerky Chews (Feeding the Way Nature Intended), and the Endurance Blend Complete Beef Patties. Both products are grain free, gluten free, with no added hormones or preservatives and are made here in the USA. The bulk of Sulley’s and Junior’s raw diet is made up of whole raw that I buy through my co-op, but I like to supplement with new proteins and ingredients to add variety and excitement. Loaded with protein, vitamins, and minerals, and sourced from cows raised on USDA inspected, family farms, the Endurance Blend Complete Beef Patties contain a perfect blend of beef, tripe, trachea, and finely ground bone, supplying a nutritious and delicious addition to an otherwise routine raw or kibble diet. Check out this video I made of Sulley and Junior experiencing the Endurance Blend Complete Beef Patties for the first time. While these patties would not make an economical choice to feed alone given the number of patties necessary for a big dog like Sulley or Junior, they do make a fantastic, easy to feed supplement. One of the best ways that I have found to cut costs of feeding raw is to look for discounts and deals. I do this by buying in bulk through a raw food co-op, or taking advantage of sales and discounts through an online retailer like Raw Paws Pet Food. If you are open to them, deals can be found. With every click to the Raw Paws Pet Food homepage, you will find sales and discounts being offered. Every Wednesday one of their products is discounted 40-50%. This week it is the, you guessed it, Endurance Blend Complete Beef Patties which are 50% off through Friday. Recognizing most of you, like me, are very cost-conscious, I wanted to give you enough notice about this sale so that you could take advantage of it. Perhaps this is my way of justifying a slightly more involved dietary choice for my big dogs. But I believe one of the most important aspects of feeding raw is keeping in mind the investment you are making in your dog’s health. Whether this is in the form of a healthier skin and coat, boosted immune system, improved digestion, or just the substantially smaller poops to pick up, the benefits of feeding raw abound. However, a quick application of this mindset shift using the Endurance Blend Complete Beef Patties as an example, is the addition of trachea. Trachea is an organ that naturally contains glucosamine and chondroitin, both of which help the body produce new cartilage to promote joint health and function. While great for dogs of all sizes, glucosamine and chondroitin are particularly beneficial for large and giant breed dogs. Because I don’t normally feed trachea, I consider these Endurance Patties to be an investment in added nutritional balance for Sulley and Junior. Yes, life would be simpler if I had small dogs. Travel, cleaning, laundry, and feeding raw would be less expensive, complex and time consuming. But with ingenuity, resourcefulness, dedication, and a whole lot of patience, feeding raw to big dogs is not only possible, it can be accomplished without breaking the bank. Impressed with the video. I can see you have tow big fans of the Endurance food! Aww, thank you! My daughter is 12 and is still learning how to keep the phone still and not put her fingers over the camera. In spite of those challenges, I think it turned out well. Hopefully we were able to show how much the boys really do love these Raw Paws beef patties! Thank you so much for your comment and question, Janelle! I am not sure about Raw Paws. While I have not heard of any recalls, this would be a question for one of their customer support folks. 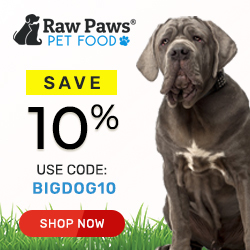 Secondly, I would absolutely consider Raw Paws as a supplement to your Mastiff’s diet, however, with three giant dogs, feeding just this as their entire diet will be pricey. I would encourage you to find a local source for whole raw – usually a raw food co-op or meat market. I don’t know where you live, but I’m happy to help you track down local options for whole raw. Just message me.